Sweet & Sour Sauce—Now with Brown Sugar! 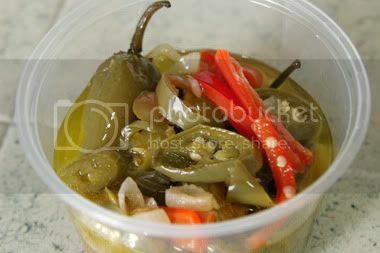 Simply put this is a pickled jalapeño dish. Depending on what part of the world you are in, escabeche can mean a variety of things, and spelled the same way it is pronounced a variety of ways. For our purposes, it's a vinegar and oil concoction of jalapeños. Note: even though I put these in a plastic jar for a quick bit, they should be stored in glass or ceramic containers. The acid will leech the icky stuff out of the plastic and cause a third eye or something equally bad. 1. Prepare the jalapeños any which way you want to preserve them. If you opt to keep them whole, cut a small X in the bottom of the pepper to allow the liquid to penetrate the insides. (As you can see from the picture, I kept some intact, sliced others). 2. Do a self-assessment. If you're heat-intolerant, you may want to discard the seeds. I did not follow my own advice here. The half-Mexican part of me took over the half-not Mexican and left ALL the seeds in. 3. Put all the ingredients in a sauce pan and bring to a boil. Open all the windows, and keep the hood fan running because boiled vinegar is pungent. 4. Once the boiling point is reached, simmer uncovered for an hour. 5. Enjoy the pungent smell of vinegar. Or go sit outside. This step is open to interpretation, but you do have an hour to kill. I chose to talk to my mom on the phone about how my Mexican side was showing itself. She was very proud. 6. Cool your concoction then store it in a glass or ceramic container. You can put in pickling jars and do a hot water bath. They'll supposedly last longer (about a month) in the fridge. Mine have been in the fridge for a week in a simple glass container and they're already half gone. So your mileage may vary. The liquid from this recipe can also be used separately. I've used it on pizza dough to give it a golden brown crust with a spicy kick. Or as a simple spicy vinaigrette. The options are endless. Nice. I have never heard of this actually but I am suddenly in the mood for pupusa's to go along with this, hmmm. Any other ideas to put this on? I've put them on homemade pizza. Along with blueberries, goat cheese, and walnuts. You can go crazy with it!